COLOGNE, Germany, Oct. 4, 2018 /PRNewswire-PRWeb/ — DigiLens announced that its MonoHUD waveguide augmented reality (AR) display will be integrated into Sena’s Momentum smart helmet. Available in the fourth quarter of 2019, the new helmet will provide motorcycle and bike riders with distraction-free head-up display content streamed directly in their line of sight, so they can keep their eyes focused on the road ahead. 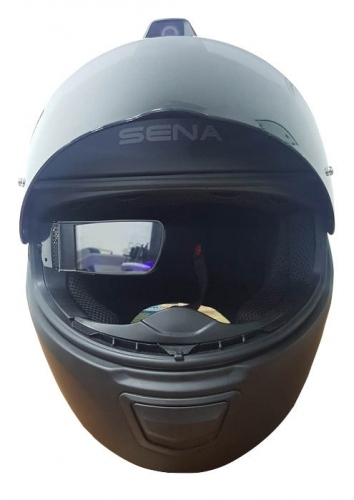 The Sena Momentum smart helmet uses the breakthrough DigiLens waveguide HUD that allows riders to see key information like bike speed, fuel level status, and navigation as well as phone, music and other apps—all without looking down at their smartphone. With full color display in daylight brightness and up to eight hours of battery, the Sena Momentum smart helmet will fast become the new standard for motorcycle safety and ease of use. DigiLens’ waveguide optics allow OEMs to access eyeglass-thin displays for wearable AR applications and larger displays for automobiles, avionics, retail and architecture. The company has developed a photopolymer material and holographic copy process to manufacture precision diffractive optics by printing rather than traditional expensive methods like precision etching. The resultant eyeglass display has higher efficiency and wider field of view, where its breakthrough copy manufacturing method delivers a cost performance unmatched by others. DigiLens has formed strategic partnerships with other HUD and AR market leaders including Panasonic, Sony, Rockwell Collins, Continental and Foxconn.